Dark outpourings of lava gave the "man in the moon" his face more than three billion years ago. And volcanic activity continued on the moon until it halted a billion years ago – or so lunar scientists have long thought. The discovery was announced in a paper published online Oct. 12 in Nature Geoscience. Sarah Braden, a recent School of Earth and Space Exploration graduate, is the lead author; the others are Julie Stopar, Samuel Lawrence and Mark Robinson, all researchers in the school, and Carolyn van der Bogert and Harald Hiesinger of the Westfälische Wilhelms-Universität Münster in Germany. The science team identified 70 small volcanic features scattered across the moon's dark volcanic plains, or maria. The features show as a combination of smooth, low, rounded mounds near patches of rough, blocky terrain. 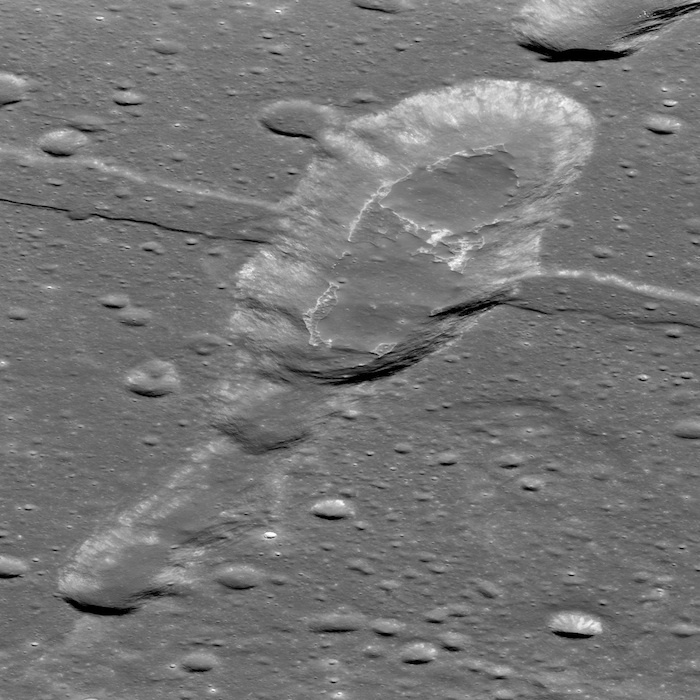 The scientists refer to these unusual areas as irregular mare patches. "Finding previously unknown geologic features on the lunar surface is extremely exciting," says Braden. The features are too small to be seen from Earth, averaging less than a third of a mile (500 meters) across their largest dimension. One feature named Ina has been known for a long time, having been imaged from lunar orbit by Apollo 15 astronauts in the 1970s. Several early studies indicated that Ina could be very young (10 million years or less), but only a few irregular mare patches were known then, and their significance was unclear. It was not until the scientists had high-resolution images showing the entire moon that the full extent and significance of the small lava features were understood. These images are the product of the two Narrow Angle Cameras that form part of the Lunar Reconnaissance Orbiter Camera system. Co-author Mark Robinson is the principal investigator for the camera, which is on NASA's Lunar Reconnaissance Orbiter spacecraft. The ages of the irregular mare patch features come from studies of crater sizes and numbers within a given area by Braden, assisted by van der Bogert and Hiesinger. These crater-counting dates are linked to laboratory ages provided by Apollo and Luna samples. The results show that instead of lunar volcanism stopping abruptly about a billion years ago, it ended more gradually, continuing until less than 50 million years ago. "The existence and young age of the irregular mare patches provides a new constraint for models of the lunar interior's thermal evolution," Braden says. "The lunar mantle had to remain hot enough for long enough to provide magma for the small-volume eruptions." Robinson notes that the new discovery is hard to reconcile with what's currently thought about the temperature of the moon's interior. "These young volcanic features are now prime targets for future exploration, both robotic and human." The discovery gives the moon's volcanic history a new chapter. As Braden says, "Our understanding of the moon is drastically changed by the evidence for volcanic eruptions at ages much younger than previously thought possible, and in multiple locations across the lunar maria." The Lunar Reconnaissance Orbiter spacecraft is managed by NASA's Goddard Space Flight Center in Greenbelt, Maryland, and the Lunar Reconnaissance Orbiter Camera's Science Operations Center is located on ASU's Tempe campus. 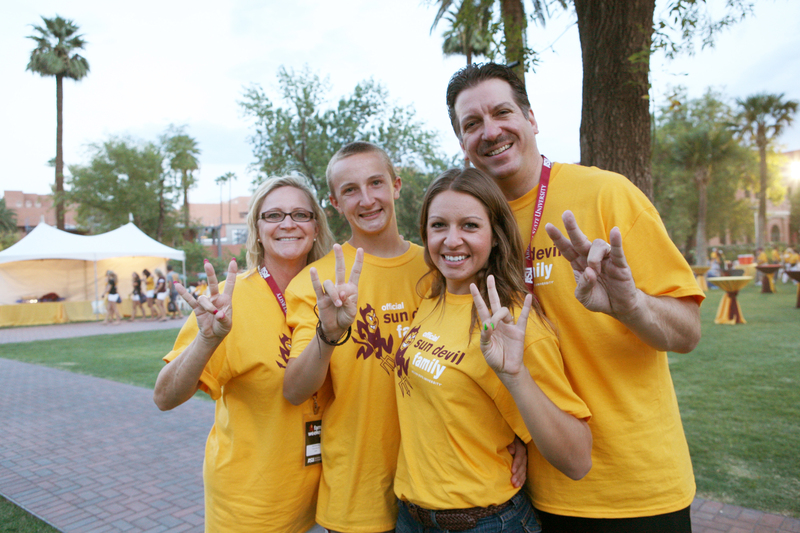 This year, Arizona State University will welcome more than 6,000 visitors campus-wide for the 2014 Family Weekend, Oct. 17-19. This year, Arizona State University will welcome more than 6,000 visitors campus-wide for the 2014 Family Weekend, Oct. 17-19. The celebration of spirit, pride and tradition has never been higher, with record numbers of registrants for the signature Family Weekend events. From a Spirit Hike to the Signature Tailgate barbecue, the weekend is filled with activities designed to give families a glimpse into their Sun Devil’s experience. Family members will celebrate with their student during three days of entertainment and activities scheduled across all four campuses. • Off-Campus and Graduate Student and Family Picnic, 4-6 p.m.: Families are invited to bring blankets to enjoy this picnic on the lawn of ASU’s Student Services Building. • ASU Fairytale Theater’s “The Snow Queen,” 5-6 p.m.: Herberger Institute for Design and the Arts students will present the Hans Christian Andersen tale that inspired Disney’s animated hit film. Face-painting and delicious treats will offer fun for all ages. • MU After Dark presents Frozen in the Desert, 7 p.m.: This special Disney-themed event will feature games, music, treats and a showing of “Frozen” on Hayden Lawn. Expect a few surprises to make this a memorable ASU family night. The fun continues into the weekend with many more exciting events. The Spirit Hike is one of the highlights of Saturday morning, offering a chance to take in breathtaking views, get a little exercise and experience a time-honored ASU tradition. Sparky and students from the ASU Student Alumni Association will lead the annual trek up “A” Mountain to help paint the iconic “A” gold in preparation for the game. The Sun Devil Family Association’s Saturday morning event is the Second Cup of Coffee breakfast. Families get a chance to make new friends, learn how to stay engaged as parents and boost their student’s success with this social event. Find out more about the association's events at http://www.asuparentsassociation.com. Families can share in Sun Devil pride and spirit during Devils on Mill, an exciting pre-game block party on Sixth Street and Mill Avenue. The event features carnival-style games and live entertainment for all ages. School spirit will be on full display at the traditional Family Weekend Tailgate barbecue and the home football game. This year, ASU will host Pac-12 rival Stanford. On the academic side, there are opportunities to meet with faculty members and advisers through open houses and social events, along with campus tours and residential college activities. Barbecues, lawn games, lectures and open houses will take place across all four ASU locations. More information on these events can be found at https://eoss.asu.edu/familyweekend or by downloading the free ASU Events App in the Google Play Store and the App Store for smart phones or tablets. While many of the events are free, some do require an RSVP.